The focus of Attorney Eric L. Green’s practice is taxpayer representation before the IRS, Department of Justice Tax Division and state departments of revenue. He is a frequent lecturer on tax topics, including estate planning, and handling tax audits and tax controversies. 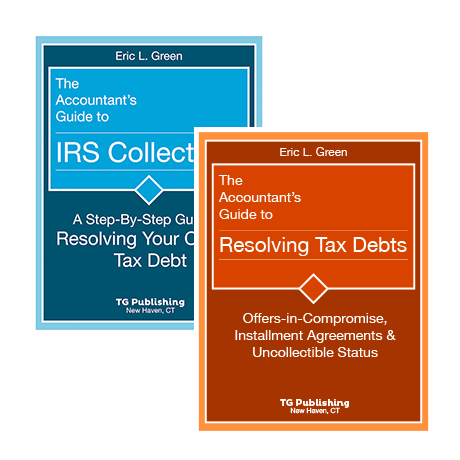 Eric runs a weekly podcast found in ITunes called Tax Rep Network, and is the author of The Accountant’s Guide to IRS Collection and The Accountant’s Guide to Resolving Tax Debts: Offers-in-Compromise, Installment Agreements & Uncollectable Status. 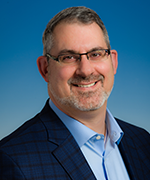 Eric is the creator, author and lecturer for the National Association of Tax Professionals Program in IRS Representation, which trains other professionals to handle IRS matters on behalf of clients. Mr. Green is a columnist for Forbes and CCH’s Journal of Tax Practice & Procedure. Attorney Green has served as adjunct faculty at the University of Connecticut School of Law where he taught law students to handle taxpayer representation matters in the low income taxpayer clinic. Prior to practicing law, Eric served as a senior tax consultant for national and international accounting firms, including KPMG and Deloitte & Touche. Attorney Green’s commitment to professional excellence is demonstrated by his involvement in numerous professional organizations. He is a past Chair of the American Bar Association’s Closely Held Businesses Committee, and has served as the chairman of the subcommittees on Business Succession Planning and Estate Planning. Attorney Green is a past Chair of the Connecticut Bar Association’s Tax Section and is a Member of its Estate & Probate Section. Eric is a Fellow of the American College of Tax Counsel, an organization in which membership is an honor reserved for those at the top of their chosen profession. The College’s members, called “Fellows,” are recognized for their extraordinary accomplishments and professional achievements and for their dedication to improving the practice of tax law. Fellows must be nominated by their peers for this honor. Self-nomination is not permitted. Each nominee must satisfy the established criteria and pass a rigorous screening process before he or she becomes a Fellow. Attorney Green is admitted to practice in New York, Connecticut and Massachusetts and is a member of the United States Tax Court Bar. Attorney Green is also a member of the Connecticut and Massachusetts Bar Associations, as well as the American Bar Association. Attorney Green received his Bachelor of Business Administration degree in Accounting with a minor in International Business from Hofstra University and is an honors graduate from New England School of Law. He earned a Masters of Laws in Taxation from Boston University School of Law. NYU Tax Controversy Forum, June 21, 2018 – What’s New in IRS Collection Enforcement? AICPA National Conference, June 13, 2018 – Offers-in-Compromise: Everything You Ever Wanted To Know! New England IRS Representation Conference, November 17, 2016 – How “Innocent” Does the Innocent Spouse Have to Be? National Association of Enrolled Agents, National Tax Practice Institute, August 6, 2012 – Civil & Criminal Tax Representation: Everything You’ve Missed in the Last 12 Months! American Bar Association, January 21, 2011 – Giving Away the Store: A Primer on Business Succession Planning and Post-Mortem Financing of Tax Liabilities of Estates Holding Closely Held Business Interests. Quoted in the Wall Street Journal: Any Benefit of Weekly Home Mortgage Payments? Quoted in Guidevine: Maximizing Your Children’s Inheritance. Eric Green's Books are Available Now! CLICK HERE TO GET THEM TODAY!